I grew up fishing the Southern California inshore and offshore scene and spinning reels, aka. coffee-grinders, were looked at with disdain. Complete and utter contempt might be more accurate. Spinning reels at the time fell short in several important categories including line capacity, drag capability, and reliability to name a few. Several important things happened to change the equation. Advances in spinning reel technology resolved the drag capability and reliability issues, but it was braided line that remediated the line-capacity issue once-and-for-all. 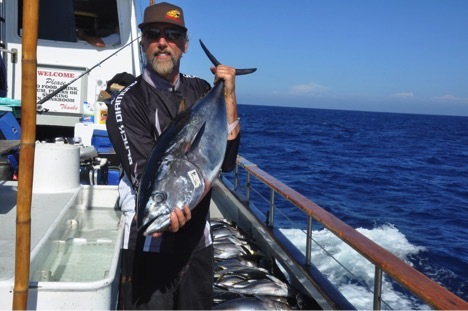 Despite the theoretical paradigm shift, I still needed to see and experience for myself how a spinning outfit would perform on local west-coast tuna before I accepted that they had a place in my arsenal. So I decided to take the spinners for a spin this last tuna season. Well actually, in some ways the season has never ended. However, it did end for me in late August when I ruptured my achilles. Of course, I was knocked out of what may have been the finest offshore season ever in the history of recorded time. No hyperbole here. My first, and as fate would have it, my last opportunity was on the annual Drew Ford two-day charter last August. With a decent chance of coming across the larger grade bluefin and the near certainty of shaking hands with the school-size yellowfin, dorado, and yellowtail it was an excellent opportunity to give this gear a real on-the-water test. I chose to pair an Accurate TwinSpin SR20 reel, loaded with 400 yards of 50# Accubraid and a short topshot of 40-lb Blackwater fluorocarbon. I mated this high-end reel to a Phoenix Black Diamond PSW-S 700H, the spinning version of a conventional rod I already knew and loved. 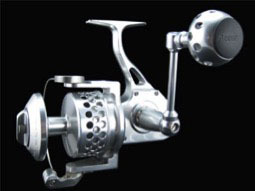 Similar high-end reels would include the Shimano Stella and Diawa Saltiga. 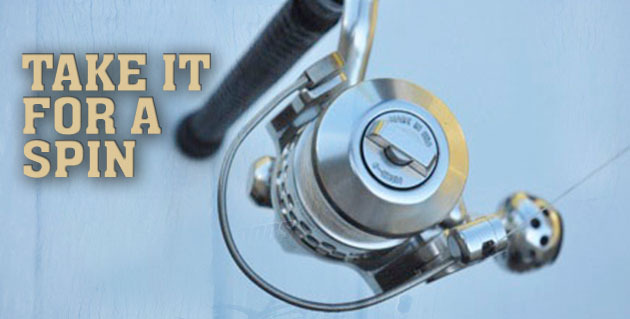 At a lower price-point would be other reels from Shimano, Diawa, Penn, and Okuma. My strategy for an accurate (no pun intended) assessment of spinning versus equivalent conventional equipment was to hook and battle a couple of the larger bluefin on each so that I could compare and contrast the effectiveness of both. Then, I would switch back-and-forth between the gear on the smaller school-size fish. The amazing thing was how well this plan came together. Keith Dennete of the Maximus with a 120 lb fish on the SR-20 and Halco Popper. The Drew Ford charter was booked on the New Lo-An with Captain Markus Medak. As an aside, one of the factors that convinced me to try the spinning gear was a conversation with Markus on the previous year’s charter. You may remember that triple-digit bluefin were being hooked and with some luck and skill landed. I made fun of a picture I saw of Markus posing with a freshly boated 100-pound class bluefin. In the background, I could see an angler pinned to the rail, fighting one of the big-boys on a white spinning outfit. Markus quickly explained that the angler in question did indeed land the big bluefin and did quite well with that same gear on previous trips. I had expected him to join in the lambasting of the poor fool, but was taken aback at this response. As we headed out on the warm August night, Markus explained the game-plan for the next two days. We would head to an area where there had been an early-morning sporadic bite on the bigger grade bluefin and see if we could find some biters. 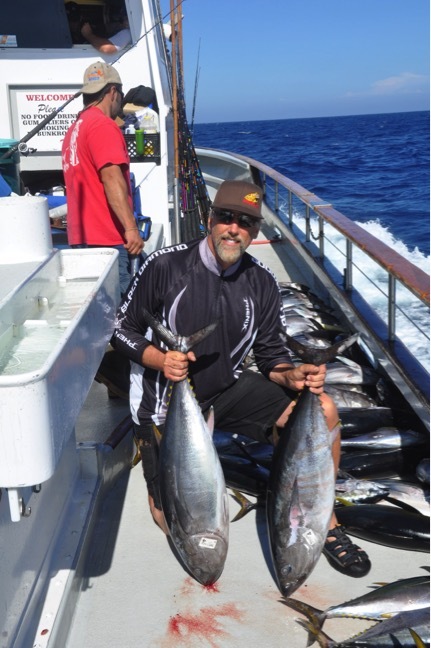 Afterwards, we would head out to the area holding kelp paddies and school-size yellowfin, dorado, and yellowtail. First thing next morning, as part of my plan, and also because of a lack of confidence and familiarity in the spinning gear, I started with the aforementioned Phenix Black Diamond PSW 700H conventional rod with an Accurate Dauntless 600. A handful of bluefin were hooked and they were nice grade 50-pound class fish. After changing baits for the third time, I selected a lively sardine and was reward shortly thereafter with a bite. 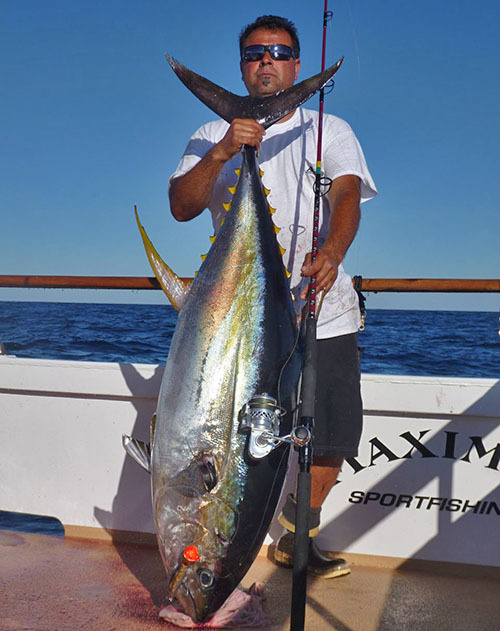 It was a decent fish and the familiar conventional gear bested the near 50-pound bluefin in about 15 minutes. Sticking to the plan, I somewhat reluctantly put the trusty outfit in the rack and picked up the unfamiliar, unproven spinning outfit. Bear in mind, I use spinning outfits for some of my freshwater fishing, but never, ever had used one inshore or offshore in the salt. I proceeded to the bait tank and selected a good-looking sardine. I casted to the downwind chum-corner spot and the sardine took off, pulling coils off of the spinning reel with absolutely no effort. The first thing I realized is that using this gear, an angler would never again have to deal with a backlash trying to cast a sardine, or the even more difficult anchovy. The second thing I noticed, and probably more important, was that the sardine was able to swim freely, unconstrained by the drag of a revolving conventional reel spool and the pressure of the angler lightly thumbing the spool to prevent overrun. I truly believe that one key to getting more bites is allowing the sardine to swim unencumbered by any discernable drag after the initial cast. I swear, once a sardine realizes it is dragging a line behind it, it seems to lose its spirit and ceases to swim strongly. This is a delicate art using a conventional reel and is cake, I discovered, using spinning gear. I was looking down at the strange contraption, marveling at how the sardine was easily pulling coils off the reel, when the rate at which the coils left the reel picked up speed dramatically. Holy cow, I was bit. I reached down instinctively and turned the handle, expecting the bail to trip and come tight with my fish. It was then I was reminded that unlike their freshwater little brothers, these bigger spinning reels require you to reach down and manually trip the bail to engage the reel. So I did that and since I was using a circle-hook, I let the fish come tight and felt the power of another bigger bluefin. The fight was fun, and despite the good-natured teasing about the coffee-grinder from the chartermaster Rob, I enjoyed the fight. The Accurate reel and Phenix rod were easily up to the task and I had the twin to the first bluefin to gaff in virtually the same amount of time as when using the more familiar conventional gear. On the initial run of the Bluefin, the drag was super-smooth and at no time did I have any concerns about the performance of the gear. The Phenix spinning rod also did its job as I lead my first spinning-rod tuna, and a decent one at that, to gaff. Become the best caster of baits, by not using the baitcaster. 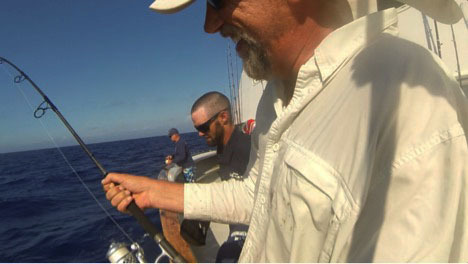 The bite shut down so Markus made the move to the area that was holding kelps , yellowfin, and the other species. When we found a nice school of hungry yellowfin, I confirmed my earlier observations about the ease of fishing with bait. During several stops, I was the hot-stick with the spinning gear as I was able to cast the bait further away from the boat than all but the very best anglers. Then, the bait swam away without feeling any resistance and was repeatedly intercepted by a patrolling tuna. My experience using spinning gear for west-coast offshore fishing was a success. If you are in the top 10-percent of anglers and can already cast a bait without backlash and have the finesse needed to properly fish a bait after the cast, you may not need to add this gear to your quiver. However, if you are like me and fall into the other 90%, spinning gear might just be the ticket to propel you to the next level. I firmly believe it can increase the success rate for most west-coast anglers. As a result, they are bound to become more and more common on the West-coast offshore scene. 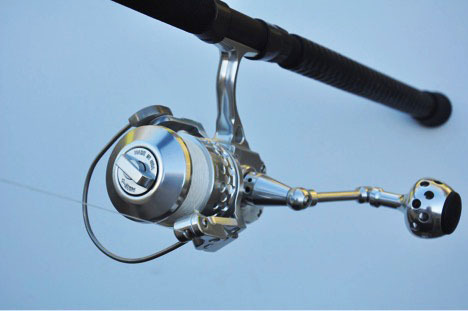 One difference between spinning gear and conventional is that you can get away with reeling against a running fish or one that won’t budge with conventional gear, but if you do that with spinning gear you are putting a twist in the line with each revolution of the handle if you are not gaining line. Do this enough and you can twist the fish right or twist the snot out of your line. My next trip and subsequent article will cover using spinning gear for throwing the iron. There was a time when I was very proficient at throwing iron on my 9-foot Trueline D8, but I simply am not that guy anymore. Living in northern California, I just don’t get the repetitions necessary to stay sharp. I am now just average, and spend a great deal of time clearing professional overruns (backlashes when it happens to the rest of you). Another area that spinning gear clearly outperforms conventional gear is popper fishing. That too will be explored in-depth at my earliest opportunity. Tenzing WF 13, The Ultimate Blind Bag?